ZOONESES & ONE HEALTH UPDATES from the CDC are a great way to stay connected and current on a wide variety of information. The CDC website hosts a monthly call, has links for past calls, and provides CE credits. It’s a great addition to the One Health initiative that is so important in South Dakota. 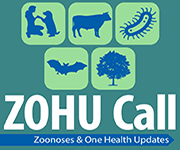 Zoonoses & One Health Updates (ZOHU) Calls are one-hour monthly webinars that provide timely education on zoonotic and infectious diseases, One Health, and related health threats at the animal-human-environment interface. Subject matter experts from multiple sectors present critical zoonoses prevention, detection, and response topics. This unique webinar allows participants to share information and gain knowledge on hot topics related to zoonoses and One Health; build partnerships across human, animal, environmental health and other sectors; create networks; and learn about emerging and important issues in One Health. Please follow the link above to access CE credits for the monthly calls.